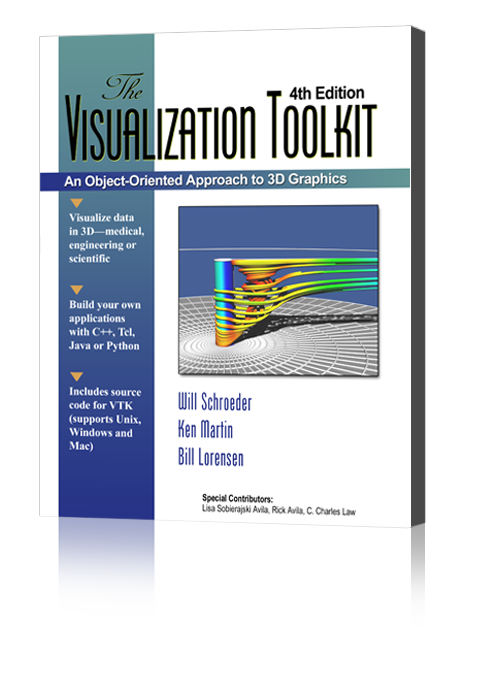 The Visualization Toolkit Text Book was first published in 1995. At that time, the book was unique. It presented the theory behind computer graphics and visualization algorithms. It also provided a free C++ toolkit called VTK. Each theory chapter of the book wrapped up with a section called Putting It All Together. These sections provided examples using the VTK software. The examples were written in C++ or Tcl. As VTK matured, the Application Programming Interface (API) also matured. For example, today, C++ and Python are the preferred languages, although Java is still available. Tcl is no longer supported. Although the VTK software has always been free, until recently the VTK Book was only available commercially. Now, the book, like the software, is also free. View or download the book here. Even though the book is over 20 years old, the concepts in the book are still relevant. The dozens of examples in the book are also still valuable for learning and using VTK. We have begun an effort to convert all of the examples in the book into C++ and present them Chapter by Chapter. These examples supplement the hundreds of examples on this VTKExamples web site.. Since some of the API's have changed, the new implementations may differ from those in the book. Also, since Tcl used less frequently, the examples have been converted to C++. The examples are also enhanced by newer VTK features, like vtkNamedColors and vtkSmartPointer. if the example produces an image, links to the full resolution image. If the caption includes a source file reference, e.g. bluntStr.cxx or rotations.tcl, that reference links to the original source code. if there is a corresponding Python example, a link to that example follows the figure line. Please enjoy this new effort to revive and maintain the VTK Figure examples. Figure 3-7(python) vtkProperty::SetInterpolationToFlat vtkProperty::SetInterpolationToGouraud Flat and Gouraud shading. Different shading methods can dramatically improve the look of an object represented with polygons. On the top, flat shading uses a constant surface normal across each polygon. On the bottom, Gouraud shading interpolates normals from polygon vertices to give a smoother look. Figure 3-10(python) vtkProperty Effects of specular coefficients. Specular coefficients control the apparent “shininess” of objects. The top row has a specular intensity value of 0.5; the bottom row 1.0. Along the horizontal direction the specular power changes. The values (from left to right) are 5, 10, 20, and 40 (SpecularSpheres.cxx). Figure 3-12(python) Camera movements around focal point (camera.tcl). Figure 3-13(python) Camera movements centered at camera position (camera2.tcl). Figure 3-24(python) vtkRenderer vtkRenderWindow vtkRenderWindowInteractor Illustrative diagram of graphics objects (Model.cxx). Figure 3-26(python) vtkSphereSource vtkConeSource vtkCylinderSource vtkCubeSource vtkPlaneSource vtkTextSource vtkPointSource vtkDiskSource vtkLineSource Examples of source objects that procedurally generate polygonal models. These nine images represent just some of the capability of VTK. From upper left in reading order: sphere, cone, cylinder, cube, plane, text, random point cloud, disk (with or without hole), and line source. Other polygonal source objects are available; check subclasses of vtkPolyDataAlgorithm. Figure 3-27(python) vtkRenderWindow Four frames of output from Cone3.cxx. Figure 3-31(python) vtkActor::RotateX,Y,Z vtkRenderer::EraseOff Rotations of a cow about her axes. In this model, the x axis is from the left to right; the y axis is from bottom to top; and the z axis emerges from the image. The camera location is the same in this and the following four images (rotations.tcl). Figure 3-31a(python) vtkActor::RotateX,Y,Z vtkRenderer::EraseOff Perform six rotations of a cow about her x-axis. Figure 3-31b(python) vtkActor::RotateX,Y,Z vtkRenderer::EraseOff Perform six rotations of a cow about her y-axis. Figure 3-31c(python) vtkActor::RotateX,Y,Z vtkRenderer::EraseOff Perform six rotations of a cow about her z-axis. Figure 3-31d(python) vtkActor::RotateX,Y,Z vtkRenderer::EraseOff First a rotation of a cow about her x-axis, then six rotations about her y-axis. Figure 3-32(python) vtkBYUReader vtkRenderer::EraseOff() vtkActor The cow "walking" around the global origin (walkCow.tcl). Figure 3-33a(python) vtkBYUReader vtkRenderer::EraseOff() vtkActor The cow rotating about a vector passing through her nose. (a) With origin (0,0,0). (walkCow.tcl). Figure 3-33b(python) vtkBYUReader vtkRenderer::EraseOff() vtkActor The cow rotating about a vector passing through her nose. (b) With origin at (6.1,1.3,.02). (walkCow.tcl). Figure 4-13(python) Importing and exporting files in VTK. An importer creates a vtkRenderWindow that describes the scene. Exporters use an instance of vtkRenderWindow to obtain a description of the scene (3dsToRIB.tcl) and (flamingo.tcl). Figure 4-19(python) vtkSphereSource vtkElevationFilter A simple sphere (ColorSph.cxx). Figure 4-20(python) vtkSphereSource vtkElevationFilter vtkTransform vkTransformFilter The addition of a transform filter to the previous example. (StrSph.cxx). Figure 4-21(python) An example of multiple inputs and outputs (Mace.cxx). Figure 4-22(python) A network with a loop. VTK 5.0 does not allow you to execute a looping visualization network; this was possible in previous versions of VTK. (LoopShrk.cxx). Figure 5-17(python) vtkCubeSource Creation of polygonal cube (Cube.cxx). Figure 5-18(python) vtkStructuredPoints vtkContourFilter Creating a image data dataset. Scalar data is generated from the equation for a sphere. Volume dimensions are 26 x 26 x 26 (Vol.cxx). Figure 5-19(python) vtkStructuredGrid Creating a structured grid dataset of a semi-cylinder. Vectors are created whose magnitude is proportional to radius and oriented in tangential direction (SGrid.cxx). Figure 5-20(python) vtkRectilinearGrid Creating a rectilinear grid dataset. The coordinates along each axis are defined using an instance of vtkDataArray (RGrid.cxx). Figure 5-21(python) vtkUnstructuredGrid Creation of an unstructured grid (UGrid.cxx). Figure 6-3(python) vtkLookupTable Flow density colored with different lookup tables. Top-left: grayscale; Top-right rainbow (blue to red); lower-left rainbow (red to blue); lower-right large contrast (rainbow.tcl). Figure 6-6(python) vtkMarchingCubes Marching cubes cases for 3D isosurface generation. The 256 possible cases have been reduced to 15 cases using symmetry. Dark vertices are greater than the selected isosurface value. Figure 6-9a(python) vtkMarchingCubes Marching cubes, case 3 is rotated 90 degrees about the y-axis with no label. Figure 6-9b(python) vtkMarchingCubes Marching cubes, case 7 is rotated 180 degrees about the y-axis with no label. Figure 6-10(python) vtkMarchingCubes Marching cubes complementary cases. Cases 3c, 6c, 7c, 10c, 12c and 13c are displayed. Figure 6-11b(python) vtkMarchingCubes Contouring examples. (b) Marching cubes surface of human bone (headBone.tcl). Figure 6-11c(python) vtkContourFilter Contouring examples. (c) Marching cubes surface of flow density (combIso.tcl). Figure 6-11d(python) vtkContourFilter Contouring examples. (d) Marching cubes surface of iron-protein (ironPIso.tcl). Figure 6-12(python) vtkElevationFilter vtkColorSeries vtkLookupTable Computing scalars using normalized dot product. Bottom half of figure illustrates technique applied to terrain data from Honolulu, Hawaii (hawaii.tcl). Figure 6-13(python) vtkHedgeHog Vector visualization techniques: (a) oriented lines; (b) using oriented glyphs; (c) complex vector visualization (complexV.tcl). Figure 6-14a(python) vtkWarpVector vtkVectorDot Warping geometry to show vector field: (a) Beam displacement (vib.tcl). Figure 6-14b(python) vtkMultiBlockPLOT3DReader vtkStructuredGridGeometryFilter vtkAppendPolyData vtkWarpVector Warping geometry to show vector field: (b) Flow momentum (velProf.tcl). Figure 6-15b(python) vtkColorTransferFunction vtkWarpVector vtkVectorDot Vector displacement plots. (b) Surface plot of vibrating plate. Dark areas show nodal lines. Bright areas show maximum motion (dispPlot.tcl). Figure 6-18(python) Flow velocity computed for a small kitchen (top and side view). Forty streamlines start along the rake positioned under the window. Some eventually travel over the hot stove and are convected upwards (Kitchen.cxx). Figure 6-19(python) vtkStreamTracer Dashed streamlines around a blunt fin. Each dash is a constant time increment. Fast moving particles create longer dashes than slower moving particles. The streamlines also are colored by flow density scalar (bluntStr.cxx). Figure 6-23b(python) vtkSphere vtkSampleFunction Sampling functions: (b) Isosurface of sampled sphere (sphere.tcl). Figure 6-23c(python) vtkImplicitBoolean vtkSampleFunction Sampling functions: (b) Isosurface of sampled sphere; (c) Boolean combination of two spheres, a cone, and two planes. (One sphere intersects the other, the planes clip the cone.) (iceCream.tcl). Figure 6-24b(python) vtkSampleFunction Implicit functions used to select data: (b) Two ellipsoids combined using the union operation used to select voxels from a volume. Voxels shrunk 50 percent (extractD.tcl). Figure 6-28(python) vtkImplicitModeller Implicit modelling used to thicken a stroked font. Original lines can be seen within the translucent implicit surface ((hello.tcl). Figure 6-30(python) vtkGlyph3D Glyphs indicate surface normals on model of human face. Glyph positions are randomly selected (spikeF.tcl). Figure 6-31(python) vtkCutter Cut through structured grid with plane. The cut plane is shown solid shaded. A computational plane of constant k value is shown in wireframe for comparison (cut.tcl). The colors correspond to flow density. Cutting surfaces are not necessarily planes: implicit functions such as spheres, cylinders, and quadrics can also be used. Figure 6-32(python) vtkCutter vtkContourFilter 100 cut planes with opacity of 0.05. Rendered back-to-front to simulate volume rendering (PseudoVolumeRendering.tcl). Figure 6-33(python) vtkContourFilter Cutting a surface model of the skin with a series of planes produces contour lines (cutModel.tcl). Lines are wrapped with tubes for visual clarity. Figure 6-39(python) vtkQuadric vtkSampleFunction vtkContourFilter Contouring quadric function. Pipeline topology, C++ code, and resulting image are shown (contQuad.cxx). Figure 6-43(python) vtkGlyph3D vtkThresholdPoints Visualizing blood flow in human carotid arteries. Cone glyphs indicate flow direction and magnitude. The code fragment shown is from the Tcl script thrshldV.tcl and shows creation of vector glyphs. Figure 6-44(python) vtkStreamTracer vtkThresholdPoints Visualizing blood flow in the human carotid arteries. Streamtubes of flow vectors (streamV.tcl). Figure 7-3(python) vtkTexture vtkGlyph3D One frame from a vector field animation using texture maps (animVectors.tcl). Figure 7-33(python) vtkTexture Example of texture mapping (TPlane.tcl). Figure 7-34(python) vtkFixedPointVolumeRayCastMapper Volume rendering of a high potential iron protein (SimpleRayCast.tcl). Figure 7-36(python) vtkRenderStepsPass vtkSimpleMotionBlurPass Example of motion blur (MotBlur.cxx). Figure 7-37(python) Example of a scene rendered with focal depth (CamBlur.cxx). Figure 7-39(python) vtkCallbackCommand vtkLineWidget Using the vtkLineWidget to produce streamlines in the combustor dataset. The StartInteractionEvent turns the visibility of the streamlines on; the InteractionEvent causes the streamlines to regenerate themselves (LineWidget.tcl). Figure 8-41a(python) vtkLinearExtrusionFilter vtkVectorText (a) Linearly extruded fonts to show letter frequency in text (alphaFreq.cxx). Figure 8-41b(python) vtkRotationalExtrusionFilter (b) Rotationally symmetric objects(bottle.tcl). Figure 8-41c(python) vtkRotationalExtrusionFilter (c) Rotation in combination with linear displacement and radius variation (spring.tcl). Figure 9-4a(python) vtkWarpScalar Carpet plots. (a) Visualization of an exponential cosine function. Function values are indicated by surface displacement. Colors indicate derivative values (expCos.cxx). Figure 9-4b(python) vtkWarpScalar vtkMultiBlockPLOT3DReader Carpet plots. (b) Carpet plot of combustor flow energy in a structured grid. Colors and plane displacement represent energy values (warpComb.tcl). Figure 9-10(python) vtkClipPolyData vtkImageDataGeometryFilter A scanned image clipped with a scalar value of 1/2 its maximum intensity produces a mixture of quadrilaterals and triangles (createBFont.tcl). Figure 9-12d(python) The stream polygon. (d) Sweeping polygon to form tube (officeTube.tcl) . Figure 9-15(python) vtkHyperStreamline Example of hyperstreamlines (Hyper.tcl). The four hyperstreamlines shown are integrated along the minor principle stress axis. A plane (colored with a different lookup table) is also shown. Figure 9-19(python) vtkProbeFilter Probing data in a combustor. Probes are regular arrays of 50 by 50 points that are then passed through a contouring filter (probeComb.tcl). Figure 9-21(python) vtkDecimatePro vtkStripper Triangle strip examples. (a) Structured triangle mesh consisting of 134 strips each of 390 triangles (stripF.tcl). (b) Unstructured triangle mesh consisting of 2227 strips of average length 3.94, longest strip 101 triangles. Images are generated by displaying every other triangle strip (uStripeF.tcl). Figure 9-24(python) vtkPolyDataNormals Surface normal generation. (a) Faceted model without normals. (b)Polygons must be consistently oriented to accurately compute normals. (c)Sharp edges are poorly represented using shared normals as shown on the corners of this model. (d) Normal generation with sharp edges split (Normals.cxx). Figure 9-27a(python) vtkDecimatePro Examples of decimation algorithm. (a) Decimation of laser digitizer data (deciFran.tcl). Figure 9-27b(python) vtkDecimatePro Examples of decimation algorithm. (b) Decimation of terrain data (deciHawa.tcl). Figure 9-38a(python) vtkGaussianSplatter Elliptical splatting. (a) Single elliptical splat with eccentricity E=10. Cone shows orientation of vector (singleSplat.cxx). Figure 9-38b(python) vtkGaussianSplatter Elliptical splatting. (b) Surface reconstructed using elliptical splats into 100 3 volume followed by isosurface extraction. Points regularly subsampled and overlaid on original mesh (splatFace.tcl). Figure 9-43a(python) vtkTexture vtkThresholdTextureCoords vtkStructuredGridGeometryFilter Examples of texture thresholding. (a) Using scalar threshold to show values of flow density on planes for various values (texThresh.tcl). Figure 9-43b(python) vtkImplicitTextureCoords Examples of texture thresholding. (b) Boolean combination of two planes to cut nested spheres (tcutSph.cxx). Figure 9-45b(python) vtkBooleanTexture vtkImplicitTextureCoords (b) Sixteen boolean textures applied to sphere (quadricCut.cxx). Figure 9-47a(python) vtkPointSource vtkStreamTracer Using random point seeds to create streamlines (office.tcl). Figure 9-47b(python) vtkPointSource vtkStreamTracer Using random point seeds to create streamlines (office.tcl). Figure 9-48(python) vtkImplicitBoolean vtkClipPolyData A plane clipped with a sphere and an ellipse. The two transforms place each implicit function into the appropriate position. Two outputs are generated by the clipper. (clipSphCyl.tcl). Figure 9-50(python) vtkGaussianSplatter Visualization of multidimensional financial data. (finance.cxx). The gray/wireframe surface represents the total data population. The red surface represents data points delinquent on loan payment. Figure 9-51a(python) vtkMCubesReader vtkPolyDataConnectivityFilter The isosurface, with no connectivity filter applied connPineRoot.tcl. Data is from 256^3 volume data of the root system of a pine tree. Figure 9-51b(python) vtkMCubesReader vtkPolyDataConnectivityFilter The isosurface after applying the connectivity filter to remove noisy isosurfaces connPineRoot.tcl. Data is from 256^3 volume data of the root system of a pine tree. Figure 9-52a(python) vtkMCubesReader vtkPolyDataConnectivityFilter The isosurface after applying the connectivity filter to remove noisy isosurfaces and reduce data size connPineRoot.tcl. Data is from 256^3 volume data of the root system of a pine tree. Figure 9-52b(python) vtkMCubesReader vtkDecimatePro vtkConnectivityFilter The isosurface after applying the decimation and connectivity filters to remove noisy isosurfaces and reduce data size deciPineRoot.tcl. Data is from 256^3 volume data of the root system of a pine tree. Figure 9-53(python) vtkBYUReader vtkStructuredPointsReader vtkTexture vtkImplicitTextureCoords Texture cut used to reveal internal structure of a motor. Two cut planes are used in combination with transparent texture (motor.tcl). Figure 9-54(python) vtkDelaunay2D vtkMinimalStandardRandomSequence vtkExtractEdges vtkGlyph3D vtkTubeFilter Two-dimensional Delaunay triangulation of a random set of points. Points and edges are shown highlighted with sphere glyphs and tubes (DelMesh.tcl) . Only the pipeline to generate triangulation is shown. Figure 10-2(python) vtkImageGaussianSmooth Low-pass filters can be implemented as convolution with a Gaussian kernel. (GaussianSmooth.tcl). Figure 10-4(python) vtkImageHybridMedian2D vtkImageMedian3D Comparison of median and hybrid-median filters. The hybrid filter preserves corners and thin lines, better than the median filter. hybrid median (HybridMedianComparison.tcl. Figure 10-5(python) vtkImageMarchingCubes vtkImageShrink3D vtkImageGaussianSmooth This figure demonstrates aliasing that occurs when a high-frequency signal is subsampled. High frequencies appear as low frequency artifacts. The lower left image is an isosurface of a skull after subsampling. The right image used a low-pass filter before subsampling to reduce aliasing (IsoSubsample.tcl). Figure 10-6(python) vtkImageGaussianSmooth vtkImageMathematics vtkImageShiftScale This MRI image illustrates attenuation that can occur due to sensor position. The artifact is removed by dividing by the attenuation profile determined manually. (Attenuation.tcl).. Figure 10-9(python) vtkImageLaplacian vtkImageMathematics High-pass filters can extract and enhance edges in an image. Subtraction of the Laplacian (middle) from the original image (left) results in edge enhancement or a sharpening operation (right) (EnhanceEdges.tcl). Figure 10-10(python) vtkImageFFT vtkImageFourierCenter vtkImageLogarithmicScale vtkImageMagnitude The discrete Fourier transform changes an image from the spatial domain into the frequency domain, where each pixel represents a sinusoidal function. This figure show an image and its power spectrum displayed using a logarithmic transfer function (VTKSpectrum.tcl). Figure 10-11(python) vtkImageFFT vtkImageRFFT vtkImageIdealHighPass vtkImageButterworthHighPass This figure shows two high-pass filters in the frequency domain. The Butterworth high-pass filter has a gradual attenuation that avoids ringing produced by the ideal high-pass filter with an abrupt transition (IdealHighPass.tcl). Figure 10-12(python) vtkImageConstantPad vtkImageMirrorPad Convolution in frequency space treats the image as a periodic function. A large kernel can pick up features from both sides of the image. The lower-left image has been padded with zeros to eliminate wraparound during convolution. On the right, mirror padding has been used to remove artificial edges introduced by borders (Pad.tcl). Figure 10-14(python) vtkImageDilateErode3D vtkImageSeedConnectivity This figure demonstrates various binary filters that can alter the shape of segmented regions (MorphComparison.tcl). Figure 10-16(python) vtkImageMagnify vtkImageGaussianSmooth vtkImageGradient vtkImageEuclideanToPolar vtkImageExtractComponents vtkImageHSVToRGB An imaging pipeline to visualize gradient information. The gradient direction is mapped into color hue value while the gradient magnitude is mapped into the color saturation (ImageGradient.tcl). Figure 10-17(python) vtkBMPReader vtkImageLuminance vtkWarpScalar vtkMergeFilter Combining the imaging and visualization pipelines to deform an image in the z-direction (imageWarp.tcl). The vtkMergeFilter is used to combine the warped surface with the original color data. Figure 12-2(python) The skin extracted from a CT dataset of the head (Medical1.cxx). Figure 12-3(python) Skin and bone isosurfaces (Medical2.cxx). Figure 12-4(python) Composite image of three planes and translucent skin Medical3.cxx. Figure 12-6(python) vtkMetaImageReader Photographic slice of frog (upper left), segmented frog (upper right) and composite of photo and segmentation (bottom). The purple color represents the stomach and the kidneys are yellow (frogSlice.tcl). Figure 12-7(python) vtkMetaImageReader vtkMarchingCubes vtkImageGaussianSmooth vtkImageGaussianSmooth The frog’s brain. Model extracted without smoothing (left) and with smoothing (right). Figure 12-9b(python) vtkMetaImageReader vtkMarchingCubes vtkImageGaussianSmooth vtkWindowedSincPolyDataFilter The complete frog without skin. Figure 12-9c(python) vtkMetaImageReader vtkMarchingCubes vtkImageGaussianSmooth vtkWindowedSincPolyDataFilter No skin or skeleton. Figure 12-11(python) vtkRibbonFilter vtkLinearExtrusionFilter Two views from the stock visualization script. The top shows closing price over time; the bottom shows volume over time (stocks.tcl). Figure 12-13(python) vtkImplicitModeller A logo created with vtkImplicitModeller (vtkLogo.cxx). Figure 12-14(python) vtkStreamTracer vtkTubeFilter Portion of computational grid for the LOx post (LOxGrid.tcl). Figure 12-15(python) vtkStreamTracer vtkTubeFilter Streamlines seeded with spherical cloud of points. Four separate cloud positions are shown. Figure 12-16(python) vtkStreamTracer vtkTubeFilter Streamtubes created by using the computational grid just in front of the post as a source for seeds (LOx.tcl). Figure 12-20a(python) Towers of Hanoi. (a) Initial configuration. Figure 12-20b(python) Towers of Hanoi. (b) Intermediate configuration. Figure 12-20c(python) Towers of Hanoi. (c) Final configuration Hanoi.cxx.